Our mission: Build the capacity of leaders to establish and sustain highly effective professional learning. Learning Forward members learn how to leverage professional learning to ensure every student has an equal opportunity to learn at high levels. Our beliefs & priorities Become a member today! 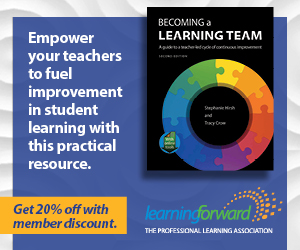 Educators around the world use Learning Forward’s Standards for Professional Learning. The Standards outline the conditions for and characteristics of professional learning that leads to improved educator practices and increased student outcomes. Learning Forward builds educators’ knowledge and skills to lead and sustain effective professional learning. Our learning programs provide strategies and tools to strengthen learning systems and build capacity at all levels. Learning Forward’s community of educators speaks up for policies that strengthen the field of professional learning. Policymakers need to hear why fully funding Title II is essential to creating schools where all students achieve at high levels. Personalized learning is clearly an area ripe for educator growth, but what should that look like? This issue will examine the ways that professional learning can support teachers’ skills in this area. Leading author and coaching expert Joellen Killion outlines her online course Effective Coaching to Strengthen Instruction. Hear how modeling effective coaching techniques at scale can lead to enduring, system-wide improvements. Topics may include mindfulness and self-care, making time for professional learning, leadership coaching, PLCs for administrators, and using distributed leadership effectively. This Institute will help educators strengthen their capacity to reach all students by building strong connections among curriculum, high-quality instructional materials including Open Educational Resources, and standards-based professional learning. Our standards help hundreds of school systems achieve results. 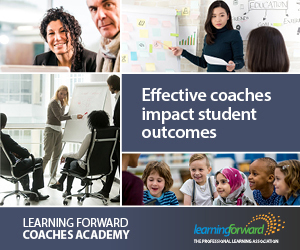 The Learning Forward Foundation boosts educators through grants, scholarships, and ongoing coaching. Our members enjoy benefits that include publications, discounts, and connections to a network of learning-driven peers around the world. Explore our intensive, two-and-a-half-year experience designed to build education leaders’ capacity in solving their problems of practice. State, provincial, and international affiliates offer opportunities for local engagement in advancing teaching and learning. Learning Forward’s bimonthly member publication brings practitioner and thought-leader perspectives to timely topics for learning leaders. Schools and school systems use the Standards Assessment Inventory to assess how teachers’ professional learning aligns with Learning Forward’s Standards for Professional Learning. Research and reports offer entry points into best practices on key topics as well as evidence about what works in professional learning. Our member newsletter showcases collaborative protocols and practical strategies for implementing learning at the school and district level.